On Tuesday 27th March, Dr David Brauner entertained an enthusiastic public audience at the Museum of English Rural Life with a talk on ‘The Jewish Anti-Pastoral’. Laughter soon rang out in the conference room at MERL, as Dr Brauner began with a series of Jewish jokes that established the tradition of a post-war Jewish urban sensibility which defines itself in part through an ignorance of, and antipathy towards, Nature. The main part of the talk was devoted to detailed readings of two post-war Anglo-Jewish novels – Emanuel Litvinoff’s The Man Next Door (1968) and Howard Jacobson’s Peeping Tom (1984) – which, Dr Brauner argued, deconstruct the traditional pastoral ideals and idylls of English literature. Applying Eve Kosofsky Sedwick’s theories of ‘homosocial desire’ and ‘triangulation’ to the rivalry in these novels between Jewish and Gentile men, Dr Brauner articulated a psychosexual interpretation of the dynamic between these men in which the ostensible Jewish female object of desire becomes a ‘conduit’ through which they express their shared paranoia about each other’s virility. Situating these novels in the context of a symbolic opposition between the feminized ‘natural’ landscape and the creeping urbanization (represented by the figure of the male Jew) that threatens it, the talk concluded with the suggestion that in the Jewish Anti-Pastoral the Jewish protagonist has a dual function – as agent and exposer of the corruption at the heart of the pastoral myth – which has theological roots: because Jews don’t believe in original sin, they cannot participate in the dream of recreating a prelapsarian era which the pastoral articulates. In this sense, the Jewish Anti-Pastoral is the expression of a fundamental philosophical and epistemological difference, a manifesto for worldliness set against the Edenic, Arcadian other-worldliness of the pastoral tradition. After Dr Brauner had finished his address, there was a lively discussion that took in Claude Levi-Strauss, Israeli jokes, the post-war suburbanization of parts of rural England and the role of the Bible in the pastoral and Anti-Pastoral genres. Dr Brauner’s was the last in a series of highly successful talks given at MERL over the past two terms by members of the English Department. 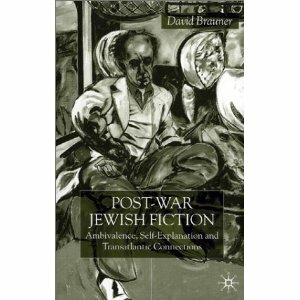 This entry was posted in Department of English Literature news and events and tagged Department of English, Dr David Brauner, Jewish Anti-Pastoral, MERL, Museum of English Rural Life, post-war Jewish fiction, Reading, University of Reading. Bookmark the permalink.